The fiercely moral founder of the British Broadcasting Corporation , Lord Reith was one of the outstanding personalities of his time. His genius for vigorous and dynamic management made the BBC a model for many other countries, and established an ideal that could be admired in others with different broadcast systems. 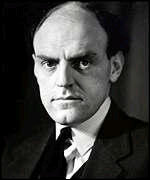 John Charles Walsham Reith was born in Stonehaven, Scotland, on 20 July 1889, the fifth son of a Presbyterian minister. His early years in a deeply religious household, brought up by a righteous father, founded his character as a devotional and a pious man. He was educated at Glasgow Academy, then Gresham's School, Holt, and studied civil engineering at the Royal Technical College in Glasgow, which led to a long apprenticeship in a locomotive works. On the outbreak of war, in 1914, he joined the Scottish Rifles, was transferred to the Royal Engineers as a lieutenant and served in France. Invalided out of the service when a sniper's bullet almost ended his life at the end of 1916, he was sent by the Ministry of Munitions to the United States, where he was much impressed by the speed and directness of their working methods. After some two years he returned to London, to a department of the Admiralty, and at the end of the war in 1918 he travelled back to Scotland to become an engineer again. Though successful, he found construction work unsatisfying and felt that (as noted in his diary) "There is some great work for me to do in the world." The chance notice of an advertisement for a General Manager of the newly formed British Broadcasting Company changed his life. He answered it and, in December 1922, received the appointment. At first, the small company, financed by a group of electrical manufacturers, was unclear in its intentions and abilities. Slowly but surely, Reith began to advance into the unknown medium of public radio transmission, organising, experimenting and innovating. Realising the almost unlimited possibilities of broadcasting, and that it must eventually become a public service, he began to shape his organisation in that direction. When he conceived broadcasting as a public service, two of the main objects of his policy were to establish the independence of the BBC from any form of interference and to build an unassailable programme. In 1925 the Government appointed a committee under the chairmanship of Lord Crawford to consider the future of British broadcasting. On their invitation, Reith prepared a plan for a public broadcasting service. His ideas were those which were subsequently to govern British broadcasting. Moreover, his passion for the narrowly orthodox ensured that the BBC would never venture far from broadcasts which could be described as responsible from all points of view: news presentations would always be of the highest quality, and Sunday observance was strictly enforced. For him, broadcasting was a means to social betterment rather than an end in itself. Whether his concerns for public welfare, as he conceived it, were calculated to provoke criticism, he did invite pressure from Whitehall and Westminster. Parliament was indeed his master, but he stood by his principles without flinching. When the General Strike broke out in 1926, and the value of broadcasting as a governmental and political instrument became apparent, Winston Churchill and others in the Government wanted to commandeer the organisation for the emergency. Reith refused to comply, maintaining the BBC's independence. He won the argument, but made an enemy of Churchill for years to come. On 1 January 1927, the company received its Charter and the British Broadcasting Corporation came into being. Reith, who was largely responsible for its establishment and form, became its Director-General and received a knighthood. Although he had the ability to draw together people who would serve him with the knowledge necessary in both the fields of broadcast engineering and in programming, his leadership was often viewed as autocratic. With his forcefulness of purpose in his work, stern and unbending, interfering in the affairs of his staff, his presence was felt throughout the corporation. Yet the magnitude of his achievement - not least in establishing the relationship of the new BBC to the British public - could be measured in the fifteen years in which he built up the BBC into a national institution. In 1938, with his work for broadcasting completed and his ideals established as traditions, he resigned to become managing director of Imperial Airways . But, two years later, when Britain was at war, he left this post to become Minister of Information under Prime Minister Neville Chamberlain . When Churchill succeeded Chamberlain in May 1940, old animosities prevailed and he was quickly transferred, first to the Ministry of Transport and then to the Ministry of Works and Buildings (the latter title was later changed to that of Ministry of Works and Planning). He was also elevated to the House of Lords, becoming Baron Reith of Stonehaven. It was during his brief period in this office that the town centres of Coventry, Plymouth and Portsmouth were destroyed by enemy bombing, and Reith urged the local authorities to begin a plan of post-war rebuilding, when he was suddenly dismissed from Government office (Churchill had remarked, vaguely, that he found Reith 'difficult to work with'). He took a naval commission as Lieutenant-Commander RNVR on the staff of the Rear-Admiral Coastal Services, and in 1943 was promoted Captain RNVR, and appointed Director of the Combined Operations Material Department at the Admiralty, a post he held until early 1945. That his administrative talents had been buried in these comparatively minor positions during Churchill's term of office was of little surprise to his friends. After the war, his sense of purpose was revived in his chairmanships of the Commonwealth Telecommunications Board , from 1946 to 1950, and the Colonial Development Corporation , 1950 to 1959. In 1948 he had accepted an invitation to become chairman of the National Film Finance Corporation , an office he held until 1951. His energy and drive in management again showed itself in his directorships, at different times, at the Phoenix Assurance Company and Tube Investments Ltd ; as a member of the board of the State Building Society , 1960 to 1964, and as vice-chairman of the British Oxygen Company , 1964 to 1966. He was Lord Rector of Glasgow University , 1965 to 1968, and, in 1967, was appointed Lord High Commissioner to the General Assembly of the Church of Scotland . When the BBC introduced the Reith Lectures in 1947 it was honouring the Corporation's debt to the man whose far-sightedness and clarity of purpose in early British broadcasting had demanded technical inventiveness and social conscience in equal proportions. While BBC Chairman of the Board of Governors, Reith was the subject of the prestigious Face to Face (BBC, 1958-60) when John Freeman interviewed him in the 30 October 1960 edition. He recalled his life and career to Malcolm Muggeridge in three memorable interview programmes, Lord Reith Looks Back (BBC), in 1967. In 1983, Roger Milner scripted a two-part dramatisation of his life, Reith (BBC, tx. 14 & 15/11/1983), featuring Tom Fleming as Reith, Peter Barkworth as Stanley Baldwin , and Robert Lang as Winston Churchill . Lord Reith, KT, GCVO, GBE, CB, died on 16 June 1971 in Edinburgh, Scotland, at the age of 81.